Pretium's bonanza features remarkably high-grade gold and silver. While I'm convinced my dog could go for days on end without breaking her gaze upon a fright-frozen bunny, we humans have more finite limits to our attention spans. After watching multiple mineral deposits in northwestern British Columbia fail to find their way into timely production, I submit that mining investors have let their guard down. From excited anticipation of NovaGold Resources' (AMEX: NG) Galore Creek joint venture and Seabridge Gold's (AMEX: SA) massive KSM project, the market's approach to the region has morphed into something resembling indifference. As a result, investors may be failing to pinpoint one fast-developing asset that could beat all of the region's prospects into production. Pretium Resources (NYSE: PVG) this week delivered a massive high-grade gold and silver resource estimate into an equity market that appears distracted by the latest round of indiscriminate selling to grip the impaired mining segment. But Fools would be downright foolish to ignore the significance of Pretium's latest achievement at its Brucejack deposit, and the very special nature of the ongoing exploration success. The following resource estimates correspond to just two of the known mineralized zones within Pretium's massive 90,000-hectare district-scale land package. Prevalent specks of visible gold catch the light in this core sample from Pretium's Brucejack deposit. In the background is a map of the area displaying the full scale of Pretium's land package, sprawling eastward from the Brucejack and Snowfield deposits. Photo by Christopher Barker. In the aptly named "Valley of the Kings" portion of the Brucejack property, Pretium records an indicated resource of 4.9 million ounces of gold with an astounding average grade of 17.3 grams per ton. The inferred resource boasts 10.4 million ounces at an even finer grade of 25.5 grams per ton. 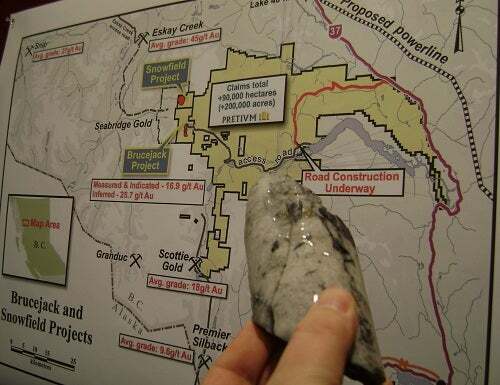 In the property's "West Zone," Pretium revealed a measured and indicated resource of 41.9 million ounces of silver to accompany 0.9 million ounces of gold (for about 1.7 million gold-equivalent ounces measured and indicated). For both estimates, an uncommonly high cut-off grade of 5.0 grams of gold-equivalent per ton was employed to isolate only the very high-grade portion of the developing resource potential. I had an opportunity to inspect drill core from Pretium's bonanza-grade intercepts in the Valley of the Kings while attending last month's Prospectors and Developers Association of Canada mining convention in Toronto, and without a doubt this is the nicest-looking core I've ever seen. Visible gold was widespread, and several samples contained a naturally occurring gold-silver alloy called electrum. 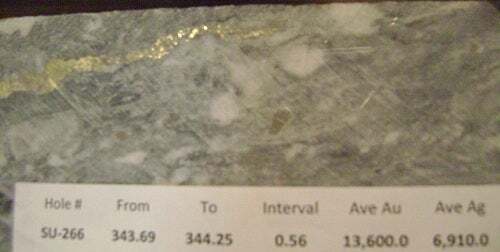 In this segment of drill core from Pretium's hole number SU-266 in the "Valley of the Kings," a ribbon of electrum is visible that accounted for the intercept's incredible bonanza grade of 13,600 grams per ton gold and 6,910 grams per ton silver over a 0.56-meter interval. Photo by Christopher Barker. Hole number SU-260, assays for which were released last October, returned even higher grades than hole SU-266. Over a 0.5-meter interval, this core contained outlandish concentrations of 17,750 grams per ton of gold and 7,780 grams per ton of silver. Photo by Christopher Barker. Frequent bonanza-grade intercepts contained within an impressively large-scale high-grade resource sets these assets apart from some of the well-known projects in the area that have failed to find a path to timely construction. Staring down some immense capital expenditures for mine construction and operation, Seabridge Gold's adjacent KSM project has thus far failed to attract a major-mining partner to commit to the massive underlying treasure of 49 million ounces of gold and 12.7 billion pounds of copper (both in the measured and indicated category). But KSM is a completely different beast, offering an average gold grade of only 0.55 grams per ton. When it comes to overcoming the typical cost-related pressures that accompany mine development in the far north, locating high-grade ore is the way to make the grade. While Seabridge and Pretium contemplate a potential pairing of Pretium's Snowfield project with Seabridge's KSM, Pretium's steady advancement of Brucejack and its uncommonly high-grade gold raises the profile of the entire geological trend with respect to a conceivable path to production. Barrick Gold (NYSE: ABX), given the company's experience operating the now-retired Eskay Creek Mine just to the northwest of these deposits, remains front and center among the miners seen as the most likely consolidator and developer of the region's concentrated bounty in gold, copper, and silver. Unlike Seabridge, however, Pretium may have the luxury of blazing its own trail to production at Brucejack in the event that an eager suitor doesn't emerge. Pretium CEO Robert Quartermain became intimately familiar with the Snowfield and Brucejack deposits during earlier exploration, when he served as president of prior owner Silver Standard Resources (Nasdaq: SSRI) and built Pretium around the C$450 million purchase of those assets. The stock now commands a $1.3 billion market capitalization, reflecting the value creation implied by the company's name (Pretium is Latin for value). Even so, I believe the market has failed to fully reflect the growing likelihood that Brucejack will host the next operating gold mine in the area near British Columbia's border with Alaska. After holding Pretium's bonanza-grade core in my hands, and considering where the Brucejack and Snowfield deposits could take this company under the capable leadership of CEO Robert Quartermain and his team, I recently initiated a share position in Pretium Resources. I encourage readers to bookmark my article list -- or follow me on Twitter -- to remain current my ongoing coverage of this and other compelling investments within the precious-metals patch. Looking for more ideas? Download The Motley Fool's special free report, "The Tiny Gold Stock Digging Up Massive Profits." Our analysts have uncovered a little-known gold miner that we believe is poised for greatness; find out which company it is and why we strongly believe in its future -- for free!